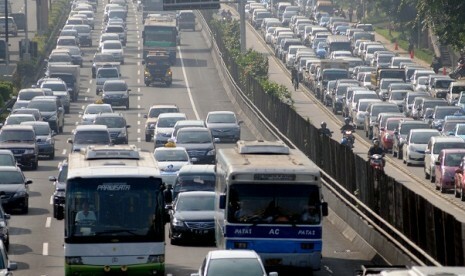 REPUBLIKA.CO.ID, JAKARTA - Starting from March 2013, Jakarta will implement odd-even license plate policy. Under the system, cars with license plates ending in an odd number can only pass the street at given day and vice versa. Government will soon socialize the new system to the citizens. "This system will encourage people to use public transportation. It can also save fuel," Governor of Jakarta, Joko Widodo, said on Thursday. He said that traffic jam could not be solved without radical policy. The system can also be applied to motorcycle. Yet, he said that the policy would only be implemented if the public transportation was ready and safe. Effective in January 2012, Transjakarta will have 200 articulated bus, while kopaja and metromini are added with 1,000 new buses. The Head of Transportation Department at Jakarta Government, Udar Pristono, explained that the odd-even regulation would be in effect from 06.00 to 20.00 on working days. It will be implemented in the main streets in the capital city. The hopeful system is claimed to decrease operational cost in around 8.85 trillion IDR per year. It can also save the fuel up to 343,000 kilo liters per year. Police will help government monitoring the system. To ease their jobs, the plates will be differentiated using colors or sticker. Vice Director of Traffic Management at Jakarta Police Department, Wahyono, said the police supported the regulation. However, he said that it would be better if the policy was implemented firstly to high class community. "We must also think on how to make people in Jakarta using public transportation," he said. The question is, shall this solution work? Not will it not work, I don't even see it implemented. There is no alternative to the car in Jakarta that is effective enough for me to visit two places in one day instead of just one when using public transport so in case I need to go, I will go and do so with my own transport. When fined I will pay this at the police station (this is cheaper than paying the officer in the street I found out recently) and I still don't pay the official fine, but hey... how should I know?! When - and also IF ever - implented, systems like the one proposed to fight Jakarta traffic congestion do rely on a combination of discipline with the road-users and a strong effort to uphold the law and regulations by officials. The sad thing is that both these essentials are non-existing in Indonesia. Hence, the plan will fail dramatically. This has no use at all if they don't provide sufficient public transportation! So they want people to leave their cars at home and use the current public transportation that is overcrowded as it is. If Jakarta had a subway system perhaps, but right now it's totally useless. If this is the aproach Indonesia has when dealing with it's problems, it certainly is going to be a long long road. A sub-way is no longer an issue if you ask me. Its price today would be the same amount as what all citizens of Jakarta urn in a year time. And as long as there is corruption, the will never be a sub-way. Though we also forget about the fact that Jakarta is sinking. And if that continues you will need to have a sub-marine-way and not a sub-way.